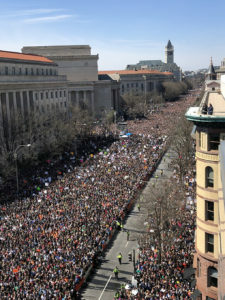 Hundreds of thousands gather on Pennsylvania from 3rd Street way beyond Trump International Hotel at 12th St.
they carried creatively crafted signs supporting gun control measures, including banning assault weapons. 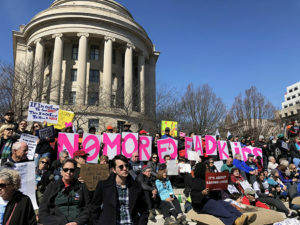 The fervor of the teenage survivors of the school shooting on Valentine’s Day has given new energy to the push to stop gun violence in America. 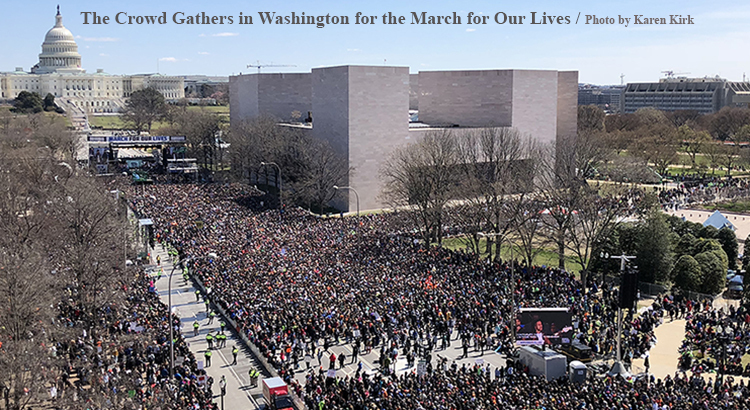 But only about 10% of the crowd was made up of teens, according to Dana R. Fisher, a professor of sociology at the University of Maryland, whose article appeared in The Washington Post. During the march, Fisher’s research team sampled 256 people who were randomly selected. They found that 70 percent of the crowd was made up of women, the average age of adults in the crowd was just under 49 years old, and participants were highly educated with 72 percent having a BA degree or higher. 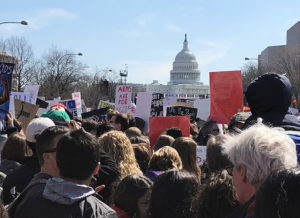 They also found that about 27 percent of participants at the March for Our Lives had never protested before. See more on the march here. Marchers pleading that no more young lives be lost to gun violence. 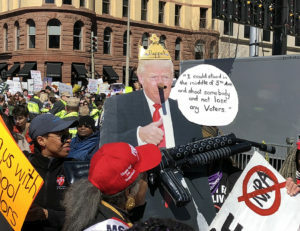 Among the more creative signs at the march were Trump (above) with an assault rifle and Pinocchio nose. Protesters young and old and every age in between rally in Washington. 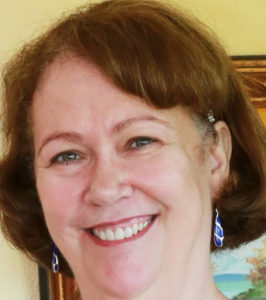 Photo Essay by Karen Kirk, Deputy Editor / Photo Editor of The Blue View and retired journalist. I think the Washington Post underestimated the number of young people there. Where where they sampling???. Where I stood, at least 60 percent of the people were 25 or under. This is the first march I have been to since the 60’s where the number of young people exceeded the number of us older folks.